I’m back again with more winter anime for human beings. Poyopoyo is about a nearly perfectly spherical cat. It ran the entirety of 2012 for 52 episodes. Each episode is a smidgen under 3 minutes. So, if my arithmetic is correct it’ll take you 2 hours, 27 minutes and 20 seconds to watch them all. 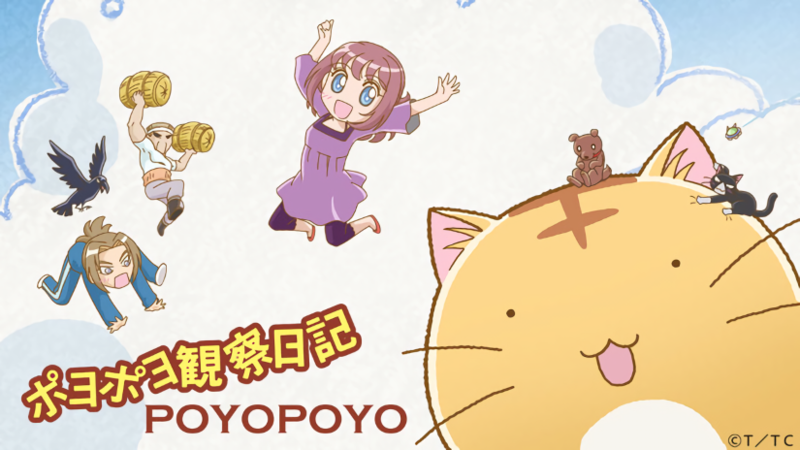 It was director Akitaro Daichi’s second cat anime following the superior Kuruneko. The bad news is, you can’t watch Kuruneko in English. As second choices go though, Poyopoyo runs it close for quality, if not realism. The cat is generally cat like, but there are also just as many jokes about his unusual size and shape. Rie Ooshima returns as animation director from Kuruneko bringing the visual charm she brought there, but with a wider colour palette. Plus, it’s got the quality page to screen gag conversion that we’ve come to expect from Daichi’s comedy shows. It also has a number of voice actors who almost feel like a troupe nowadays given how regularly Daichi uses and reuses them. Suzuko Mimori, Akira Kamiya and Hidekazu Ichinose play the family who own Poyo. They since have appeared together, or alone in a number of other Daichi projects. These include in DD Fist of the North Star, Kamisama Kiss, and the post-Poyopoyo live action Edo Cafe. Plus, it has top cartoon animal voice provider Ikue Otani (Pikachu, Chopper) as the voice of the titutlar cat. Unfortunately we’ve not been delivered a second season, so the introduction of Poyo’s mother, sister and similarly spherical nephews remain tantalising out of reach. You can see all the circular cat’s adventures at Crunchyroll.